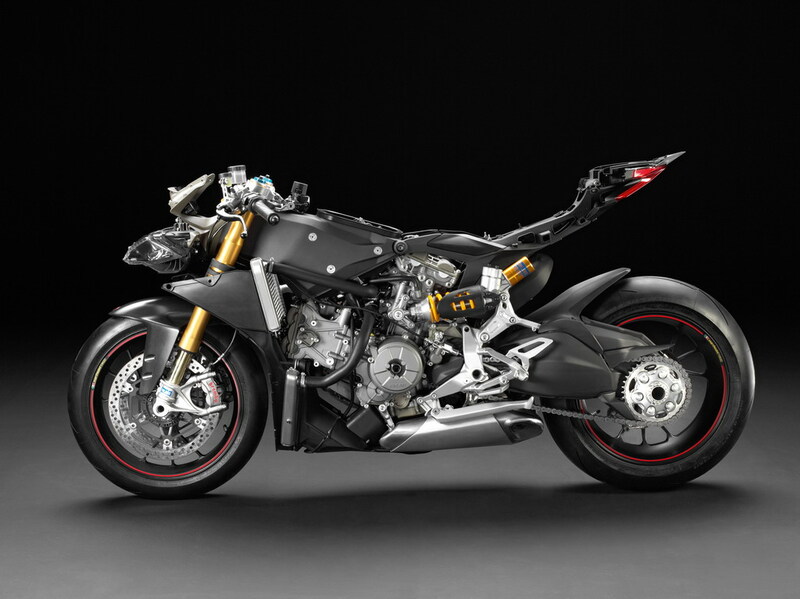 Bologna, 22 March 2012 � Two highly-anticipated images of the �naked� 1199 Panigale have been released, illustrating Ducati�s innovative and courageous step forward in motorcycle design. Merging multiple parts into one compact and lightweight component, the extremely compact monocoque construction also integrates the airbox to become one of the key elements in reducing the new Superbike�s overall dry weight by an incredible 10kg (22lb) to a benchmark 164kg (361.5lb). Using the Superquadro engine as a stressed member of the chassis, the short and strong aluminium monocoque is made in die-cast aluminium and is responsible for 5kg (11lb) of the overall weight saving of the new design. The monocoque attaches to the cylinder heads of the new specially designed engine, protruding forward to house the steering head bearings and forming the airbox along the way, which is capped-off and sealed when the lightweight aluminium fuel tank is attached, again using one component to the fulfil the roles of two. While the cylinders remain true to Ducati�s signature 90� L-twin configuration, the new engine has rotated the top-end backwards around the crankshaft a further 6� to give more clearance on the front wheel and enable engineers to modify the front and rear weight bias. This also enables a front-end geometry of 24.5� of rake and 100mm (3.94in) of trail. 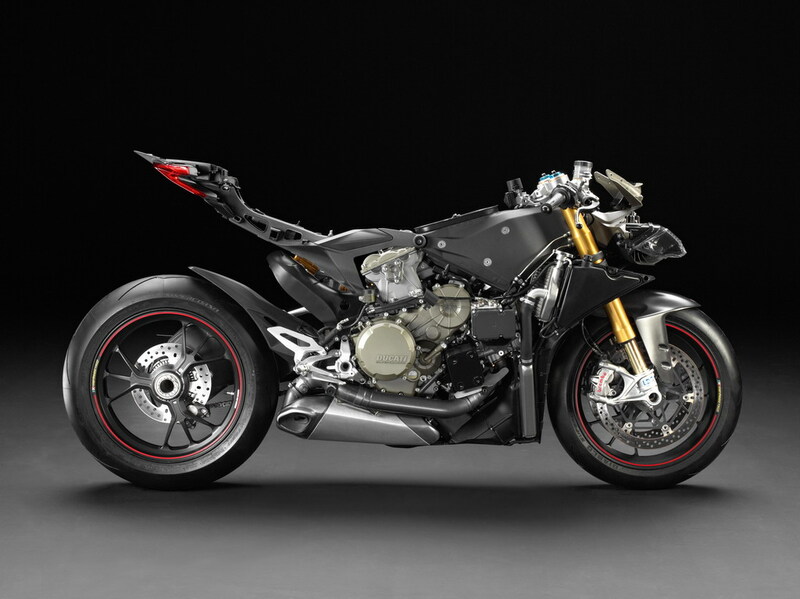 Attaching directly to the rear of the engine, the new fully die-cast aluminium, single-sided swingarm is 39mm longer than the 1198, contributing to the increased the wheelbase of 1,437mm (56.6in) and weight distribution of the 1199 Panigale from 50/50 to 52% front and 48% rear with average-size rider onboard. With the exhaust system now relocated below the engine, the die-cast aluminium rear sub-frame is considerably lighter and also attaches directly to the Superquadro engine, while the super lightweight, magnesium front sub-frame attaches directly to the monocoque frame, providing secure support for the headlamp, instrumentation and fairing. This combination of weight saving and centralisation of mass around these high front and rear sub-frame areas substantially contributes to overall vehicle agility. Shoots!!! Really naked!!! No fuel tank, no seats!!! Pheww... censored ... hehe.. looks great..
For a true motorcyclist, the straight portions of the roads exist just to take him from one turn to the next! the design under the engine is so complex that it can't be expressed by simple lines. 164 kg? ?really ,that's indeed a benchmark. For a bike that pulls strongly even beyond 300 kmph and wheelies in 5th gear, Panigale has been quite well concealed. Even some days around its release, only a handful of people had ridden it and those who rode it, including professional racers, had only praises for it. For a street legal bike, its a big thing if a professional racer appreciates it. the headlamp assembly looks intoxicating when lit. I need to know about further assemblies. Ducati Panigale 1199 getting heaps of accessories. A configurator is online now.